This is a follow up to Why and How I will switch to a stand-up desk... you may want to go and read that first. I completed day 1 of using my stand-up desk. I was prepared for a rough start as most others suggest the first 3 days are the worst. It is 11:30 PM here and as I stay up to wait to feed our 6 month old in another 30 minutes, my legs, feet and I feel fine. I don't know what shape etc the others were in, but I feel fine. I even had our 2 young kids myself tonight so even when I wasn't "working" standing I was definitely on the move ! I really tried to keep moving during the day while standing. I think it was quite successful actually for a first day, constantly shifting. I think it did keep me more alert and I don't ever really remember having any moments of tiredness as can sometimes happen when sitting. Here is a picture of the desk setup. As I mentioned before I was able to just raise my current desk, the original ikea jerker. I am very happy with the height, position and general configuration of the desk, keyboard and monitors. I now have the desk set at 44" high, for reference I am 6' 3" tall. The mat I am standing on (I'll talk about that more in a moment) does raise you up a good 3/4" so over the weekend I actually had adjusted the desk height twice, slightly increasing each time until I got it just right. I am able to adjust it in 1.25" increments. Not to mention, I actually gained a 2nd shelf that I had removed awhile ago. After using the desk for 1 day I am starting to realize that the mouse is a little low. My keyboard is naturally raised a litte since I have the reverse slope attachement on. I am going to adjust the mouse a little higher, approx 1.5", which should be relatively easy to do, and probably add a small reverse slope to it as well so its just right. Raising the desk higher at this point for the mouse alone would put the keyboard too high so its just a minor adjustment. The other 2 things (partly because my office is in a basement and I live in Canada) I wanted to track about the enviroment I spend a lot of time in is the temperature and relative humidity. According to the Canadian Centre for Occupational Health and Safety the temperature for an office setting should be in the range of 21-23°C. Its actually based on the relative humidity and season as well, but generally I would say that sounds about right. The relative humidity should be between 40-60%. Personally my body has always run hot (no seriously!) so I would always tend to prefer the cooler side of that range. Now that I am standing, which means I am working harder than when sitting, I prefer the temperature to be even cooler by a couple of degrees, say 19-20°C. With a window right beside me and winter coming I don't think having it too hot is going to be the issue, and I really wanted to ensure it didn't get too cold when its -25°C outside. There are simple ways you can monitor the humidity (moisture on the windows = too high, static shocks when walking on carpet = too low) but I decided to get a more accurate measurement. I purchased a "2 in 1 LCD Digital Indoor Thermometer W/ Hygrometer". It only cost $5.56 shipped to my door. If you zoom in on the desk picture you can see it just to the left of the keyboard and when I took the picture it was reading 22.1°C and 53% relative humidity. Just about right, a little warmer than ideal for me, but my shorts and t-shirt compensate nicely even when it only hit a high of about 12°C today. I am standing on a 20x36 GelPro Plush Woven Teak mat. It feels like someone took a cloud from the sky and put it under my feet! I don't think I would be feeling as good as I do without the mat. I have been standing on it all day with just bare feet and its been a difference maker. I would highly suggest getting an anti-fatigue mat if you are going to attempt this. A short customer service story as well for you. After paying the UPS COD charge simply fax Let's Gel a copy of the invoice and we would be happy to reimburse you for the UPS Brokerage fee. Please note: Customer is responsible for all local fees and taxes that are included in this COD charge. Lets just say I wasn't banking on that happening for weeks, if at all. Regardless, today I emailed in a scanned copy of my UPS brokerage fees, which for the record were only $15.80 but now it was more for the principal :-). After clicking send to the "customerservice" address it really felt like I might have as well just piped it to /dev/null. To my surprise about 2 hours later I received 2 emails in response. The first was a canned response from a general "customerservice" email indicating my credit card had been refunded for $13.52 (the brokerage fee part of the expense). Seconds later I got a 2nd email that was a custom response from a real human with a real name and direct phone number ! I was pleasantly surprised to get a such a speedy response, none the less from a real human. I think I have been pretty clear about my feelings so far of my stand-up desk experience. The first day has been really enjoyable and a noticeable improvement overall. I shall see what the next few days and weeks are like, but as far as I can tell my stand-up desk isn't going to walk away anytime soon. 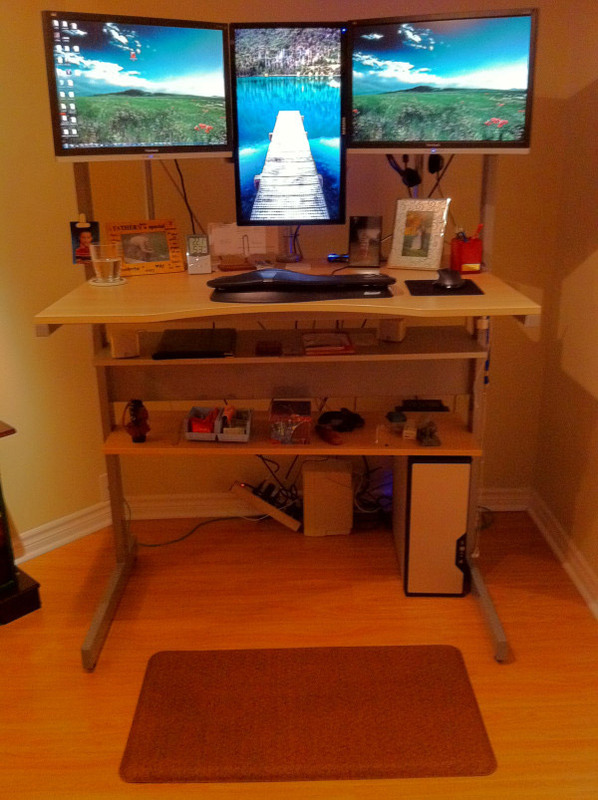 Why and How I will switch to a stand-up desk Home How much code do you read?